This weekend Children´s Books Ireland are holding their 24th annual conference at the Light House Cinema in Dublin with a glittering array of national and international speakers. It will kick off with the inaugural address of the new Irish Children´s Laureate, Laureate na nóg, Eoin Colfer. The conference has always been a stimulating and inspiring and fun highlight of the year for writers, illustrators, booksellers, teachers, librarians and all lovers of children´s literature. 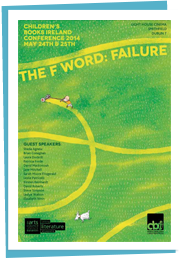 This year the chosen theme, the F word: Failure - is intriguing. The programme says they are inviting writers “to reflect on the times in their careers where things have fallen apart, deadlines went out the window and defeat was snatched from the jaws of victory.” What do you do when you are turned down by agent after agent? How do you get past the fear of failure? How do you keep going if your books are no longer finding a publisher (perhaps after years of regular commissions)? And how do you find the true grit and determination to turn the failures into triumphs, to keep going when no one actually has asked you to write in the first place? Will a book award pave the way automatically to a successful and lasting career? No doubt there will be many thoughtful discussions and a lot of laughs too. I am terribly sorry that I am so “scattered” that I will not be there. Bird by bird – that´s the way to do it. Just write the next sentence and carry on until you have finished. Such good advice. Those who don't write often seem to fail to understand how precarious a working life being a writer can be. At first glance it might be thought that a conference focusing on failure is a terrible idea but in reality coping with the ups and downs of a writing career is something we all need to learn how to do, without losing heart. It is great to have the support of knowing others have been down that road and returned successful and gives you the heart to pick yourself up and get back to the words when things are tough. We live in our words and it is important, regardless of the vagaries of the marketplace. Bird by bird. Bird by bird. A wonderful new mantra - thank you so much! Brave topic for a conference - and good to hear about an event in Dublin, Maeve. It's good to be reminded of the "bird by bird" mantra, too. Lovely to hear about the current Laureate, as well. Thanks. Bird by bird - isn't it just perfect! By the way, the conference may be about aspects of failure but is assuredly not going to be a failure - with a stellar list of speakers and attendees, it is always a brilliant weekend. It is this cat's mantra too. Maeve, while at the conference I considered blogging about it when it was my turn but you have got there first! The conference was wonderful -- in my opinion, one of the best CBI conferences ever, and many people around me seemed to agree. All the speakers adhered to the theme (this doesn't always happen), and it made for some very honest and refreshing discussions. It was perhaps a very writer-friendly conference, as it lent itself to writers talking about their craft. I don't know if it was as a result of the theme, but on the train home I came up with a whole novel outline. I may FAIL to do anything about it, of course.